David Ellefson CB-XV, 4-string bass guitar from Jackson in the X series. Jackson introduces 2 new David Ellefson Signature bass models in 4 and 5 strings. Features include an alder Concert Bass body with a gloss finish in Black or Quicksilver; bolt-on quartersawn maple neck with special profile shape, ivoroid binding and oiled finish; compound radius (12”-16”) rosewood fingerboard with 21 jumbo frets and shark fin inlays; ivoroid-bound black headstock with ’90s-style Jackson logo; EMG humbucking neck (HZ35N) and bridge (HZ35B) pickups and EMG® BEQ3 active preamp; five domed control knobs (volume control, three-band EQ, blend), four-string bridge, black hardware and David Ellefson silver “Fallout” logo on truss rod cover. Features include an alder Concert Bass body with a gloss finish in Black or Quicksilver; bolt-on quartersawn maple neck with special profile shape, ivoroid binding and oiled finish; compound radius (12”-16”) rosewood fingerboard with 21 jumbo frets and shark fin inlays; ivoroid-bound black headstock with ’90s-style Jackson logo; EMG humbucking neck (HZ40N) and bridge (HZ40B) pickups and EMG BEQ3 active preamp; five domed control knobs (volume control, three-band EQ, blend), high-mass five-string bridge, black hardware and David Ellefson silver “Fallout” logo on truss rod cover. 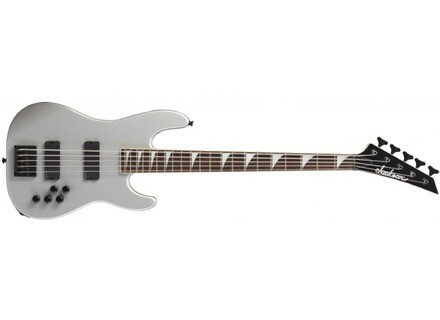 Visit www.jacksonguitars.com for more details. [NAMM] ESP Anthrax Signature Models Anthrax's Rob Caggiano (guitar) and Frank Bello (bass) get new signature models from ESP in 2012. [NAMM] Parker Maxx Fly 7 String & Maxx Fly Bass Parker introduces the Maxx Fly 7 String and the Maxx Fly Bass. [NAMM] New Washburn Stu Hamm Basses Washburn with Stu Hamm is releasing a fretless model of his signature electric bass, ‘The Hammer’.